RIO DE JANEIRO (Sporting Alert) — Mario Balotelli claimed that no one told him about the yellow card rules at the Confederations Cup, but his Italian teammate Andrea Pirlo says it’s not so. The forward was booked for lifting his shirt after scoring the winner against Mexico in their Group A contest on Sunday, which means that another yellow card would see him getting banned for one game. The AC Milan forward says he wasn’t aware of such a rule, claiming that “nobody told me” about this. However, Pirlo, who himself was on target in the game with a brilliant free-kick, congratulate Balotelli on his goal, but said he warned the former Manchester City striker about picking up silly cards – adding that he personally told him about the rules. “I want to congratulate him for his goal, but also give him a little smack,” Pirlo said. “I did tell him before the game. 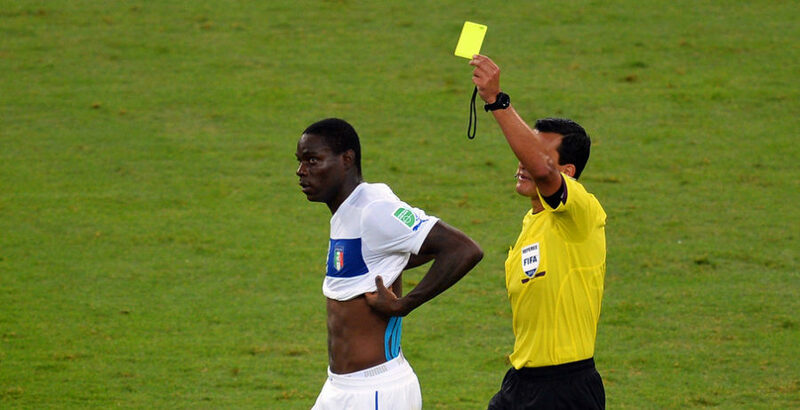 Italy coach Cesare Prandelli was also disappointed with Balotelli’s decision to pick up a needless yellow card.